At the DigiMark conference held in Karachi this year, brand and agency marketers from within and outside the country repeatedly cited Tom Goodwin’s observation that Uber owns no vehicles, Alibaba has no inventory, Airbnb owns no real estate and Facebook creates no content. One wonders why they failed to mention local or even regional examples. Here’s something I created during my time at iProspect. 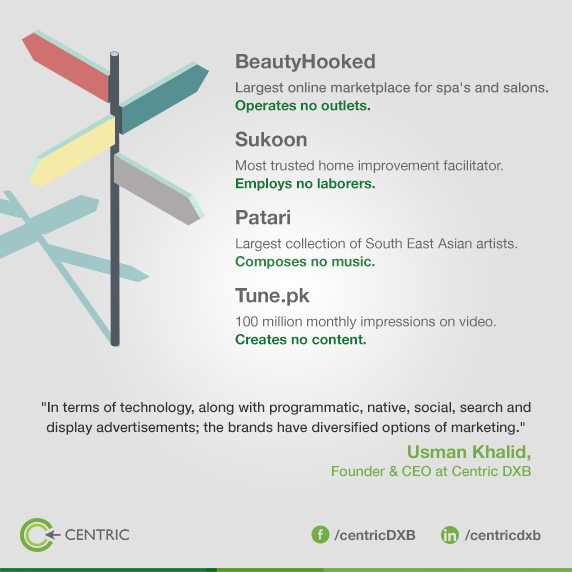 Here are Pakistan’s examples: BeautyHooked owns no salons, Sukoon employs no laborers, Patari creates no music, Tune.pk creates no content. Much has already been said about digital, the new landscape, the opportunities, the industries being disrupted and so on. Not much has been said about how marketers must act. With companies like Unilever acquiring the Dollar Shave Club for billions (under a golden handcuff structure), it’s important to remember the lessons and traits of the marketers navigating the field. The role of the CMO, in brand & agency sides goes beyond communications, plunging knee deep into production, sales, research, technology and planning. Moms buy pampers, babies wear them and the distinction is clear. So when Oscar Tuitions opened a new branch in a posh Karachi neighborhood, they hired an agency to determine the suburban dynamic between buyer, decision maker and influencer. The marketers chose to appeal to the end user, the after school student, by pointing out the proximity of the Oscar Tuition branch to the numerous recreational spots in the area. They communicated the qualifications, track record and experience of the tutors to the parents and the neighborhood Jones’s. In the end, Oscar Tuitions took on more students than it could handle, charging up to US$ 200 per month per student. They say ideas are a dime in a dozen, but execution is king. For marketers, spotting new growth opportunities is important, but even more so is coming up with the system design to deliver on them. Daraz and Kaymu work closely with leading payment providers to bring innovative payment solutions designed specifically for its customers (e.g. escrow). This enables customers to shop online with complete confidence – that their money will be safe until they are satisfied with the product delivered. 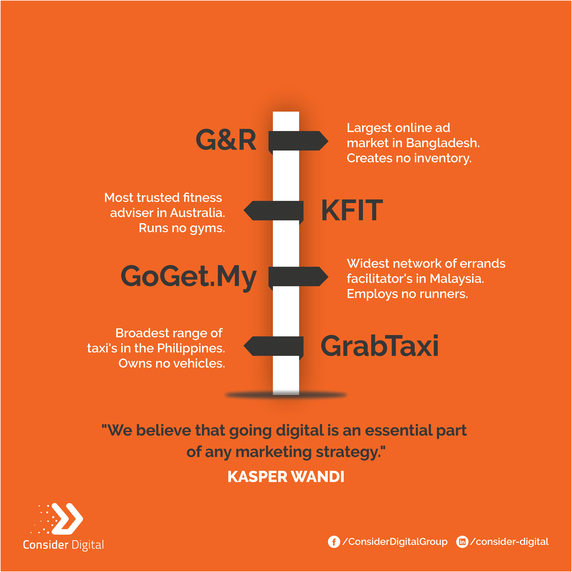 Additionally, Kaymu introduced online wholesale in Pakistan which has led to a B2B eCommerce transformation and Kaymu is very proud to have spearheaded the same. Daraz has also been responsible for bringing in Black Friday, the world’s most happening retail event, to Pakistan, and also prides in having hosted the first online fashion week, setting very high benchmarks for the eCommerce industry in Pakistan. Marketing, as a function, is not in fact about marketing but about connecting the effort from acquisition to retention. Measure your success with not just communication metrics, but also sales, brand building, affinity and the bottom line. Companies like Patari know that a unique brand voice, slick product and devoted community of fans are the best marketing. They employ a shared mind of cat lovers with creative know how and bootstrapped marketing excellence. As Eduardo Salazar aptly points out, marketers have the opportunity to forecast new trends and challenges by harnessing big data and other finer-grained techniques. Setting aside for a moment the recent controversies regarding impression, viewer and member claims by companies like Google and Facebook, we are living at a time where a sample is not the basis of decision making. In fact, it’s all the participants that are the basis of it. When dissected by qualified scientists, this can inform decision making and help a company focus where it should. By taking into account the bundles buyers gravitate towards around Islamic holidays like Eid, Kaymu increased its sales two fold this year during both Ramadan and Eid. Keeping in mind that the purchases are for oneself and others, predictive analytics played an important role. Kaymu relied on its data to offer accessories that matched clothing items and shoes, whilst in many cases putting a “stock is running out” button to positively impact conversion. Kaymu’s teams in Pakistan monitor site data, organic search data and key landing pages to inform an assessment of demand trends, and have been successful in improving conversion rates as a result. As an example, they noticed that there is strong demand for low-priced fashion amongst certain market segments, especially for new customers. Running customized campaigns for these segments helped them capture more business. Ben Agnew from from The Teeth is always focused on providing his clients with the best solution to meet their brief and business challenge. And this solution is not always something that he can fully provide with The Teeth’s in-house capabilities. After receiving a brief, his team dissects it, defines the core problem and pulls together the optimal team and resource required to solve it – focusing on core areas of expertise and complementing this with the strengths of trusted expert agency partners to fill any gaps. This collaborative approach ensures that egos are left at the door, puts the client and their problem first, and drives a win win win solution for the client, ourselves and our expert partners. We all benefit from the collaboration. The end result is a happy client and better results; rest assured that they’re getting the best combination of talent and expertise to meet the brief and we’re not over-promising by trying to deliver everything ourselves. The Teeth also benefits in the longer term as it builds its credibility, helps it to foster long term working relationships and opens the doors into new areas of business where they could not succeed alone. A good example of this was just recently when one of their clients asked them to develop and drive the development and management of an online CRM loyalty platform. While the agency does have some back-end development capabilities in-house, they wanted to ensure that they build the best solution and that meant looking to collaborate with the right partners. So Ben chose to focus on developing the strategy, concept, branding and communication and then pulled in a strong digital CRM partner to work with The Teeth to bring the concept to life and co-manage it. The project has been a great success so far, and while still in progress, it’s been a smooth development process with the right people on-board. The result is looking to be great too with the client getting a high quality, bespoke solution that one agency could not provide alone.